This USDA certified organic skin savior has the consistency of butter and a soft, shea-like scent; but don’t mistake nilotica for shea butter. A close cousin, nilotica comes from the fruit of the East African shea tree, vitellaria nilotica. LXMI founder Leila Janah discovered nilotica while in Uganda. Her experience with the butter and its ability to nourish dry, travel-burdened skin made her a believer — and it’s making me a believer, too. Shea butter is one of my favorite ingredients for healing flaky, dry skin. But unless it’s whipped and cut with other ingredients, shea butter sourced from West African trees can be hard and difficult to melt. Nilotica shea butter boasts higher olein content and a creamy, smooth texture. In my travel-sized tube, it’s absolutely perfect for on-the-go moisture. Instead of sitting on top of my skin the way a thicker Western shea butter may, nilotica soaks in quickly and leaves my skin feeling moisturized and sealed. My favorite uses for nilotica butter? Lip balm and top-of-hand treatment. It’s non-greasy and incredibly soft, melting right into my skin and leaving a soft shea scent. If you’re going to be extremely luxurious, try it on your feet at night. Divine. If I must critique LXMI’s Pure Nilotica Melt, it’s the packaging. I much prefer the travel-sized tube compared to the (absolutely gorgeous) jar and wand packaging. Besides hygiene (yeah, yeah, just wash your hands or use the wand! ), it’s impractical to tote around, and I absolutely must have this melt with me during all my fall and winter escapades. 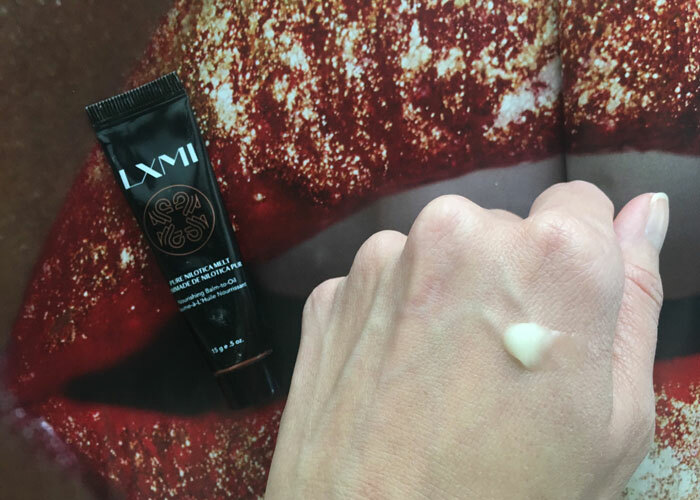 LXMI, any chance I can get this in a larger-sized tube for my everyday cosmetics bag? It’s going to be a quick repurchase. How do you heal dry, flaky skin? Have you heard of nilotica? What’s your go-to multipurpose moisturizer? Tell me in the comments.